Teasing questions ranging from Norseman Lager to American Sniper. The Picture Round is Famous Redheads and the Wild Card is a stat on the biggest audience for an American TV show. Q04. Which now defunct brewery produced brands such as Norseman Lager and Lorimer’s Scotch? Q12. Les McKeown was the lead singer of which 1970s boyband? Q25. What does 1976 Decathlon Gold Medal winner Bruce Jenner prefer to be known as these days? Q34. Who directed the 2015 movie American Sniper? 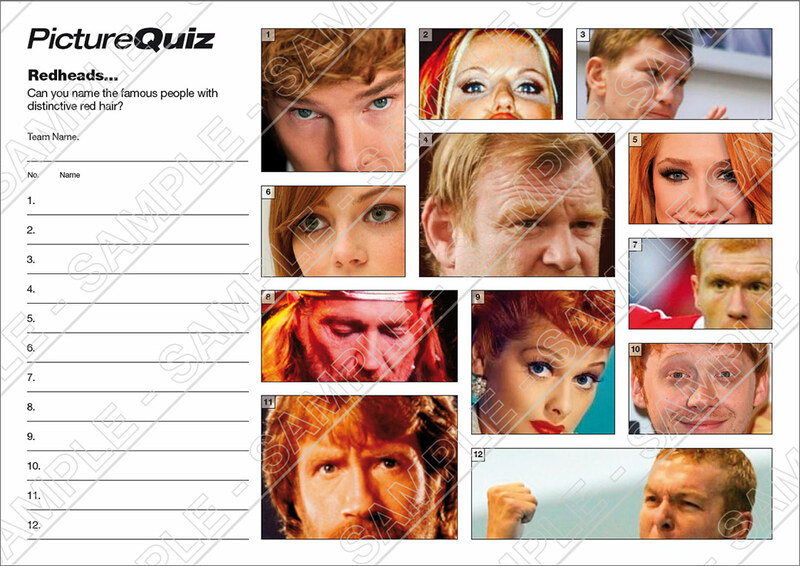 Here’s a low-res sample of Quiz 035s Famous Redheads Picture Round, click for a higher resolution version. The Picture Round download is a two page high quality PDF with the answers on page 2. Quiz 35s Picture Round is can you name these Famous Redheads? The Wild Card for Quiz 035 is an intriguing stat on the biggest audience for an American TV show.